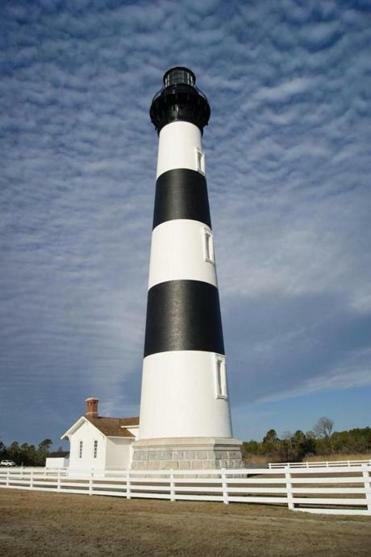 For the first time, the 1872 Bodie Island Lighthouse (pronounced “body”) on Cape Hatteras National Seashore in North Carolina’s Outer Banks is open to the public. In the past, the 214 stairs spiraling the interior of the 156-foot-tall black-and-white striped tower had been climbed only by the lighthouse keepers, National Park Service employees, and guests. The park service, which took ownership of the lighthouse from the US Coast Guard in 2000, has spent the last few years restoring the structure and repairing its rare 1871 first-order Fresnel lens. The view from the top, however, remains largely untouched. “It’s in the middle of a large tract of land in the national seashore, all still undeveloped, just the way it looked 100 years ago,” said park service spokeswoman Cyndy Holda. The public can climb to the top only on guided tours, 45 minutes long and limited to about 350 people a day. Through Columbus Day. Adults $8, children under age 12 $4; reservations at 252-475-9417.